Hi, this is collection of 5 SLP and 1 icon for your Mortar. 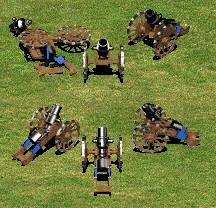 I extracted this from Age of Chivalry: Hegemony, but one SLP "Mortar Attack" is mine. In Advanced Genie Editor you may use unit 36 Bombard Cannon, but "Graphic Displacement XYZ" set on [0;0;1.4] for better spawning of projectiles. For "Attack Graphic" I used "Frame Duration" on 0.05. If anyone could create better "Corpse Graphic" with more than only 1 frame, let me hear it!